Last week, the TEDxUGA stage came to life as eight presenters shared their ideas worth spreading and the indie-rock band Family And Friends ended the night with a bang. While the talks explored a variety of ideas, each one revealed how the remarkable can happen when unexpected connections occur. And for the first time ever, we had a few special guests onstage: Snowy and Shelley, a snow corn snake and a gopher tortoise. With our largest audience ever, more than 1,400 participants joined us in the Classic Center Theatre, and over 1,700 folks tuned in via Facebook Live! Thank you to the presenters, the sponsors, and the entire TEDxUGA family for working tirelessly to make TEDxUGA 2018 a success. Couldn’t be there? Don’t worry, you still have a chance to connect with us. All of the talks will soon be posted to TEDxUGA.com, and event photos are now up on Flickr. Can’t get enough TED? Think you know someone who has an idea worth spreading? 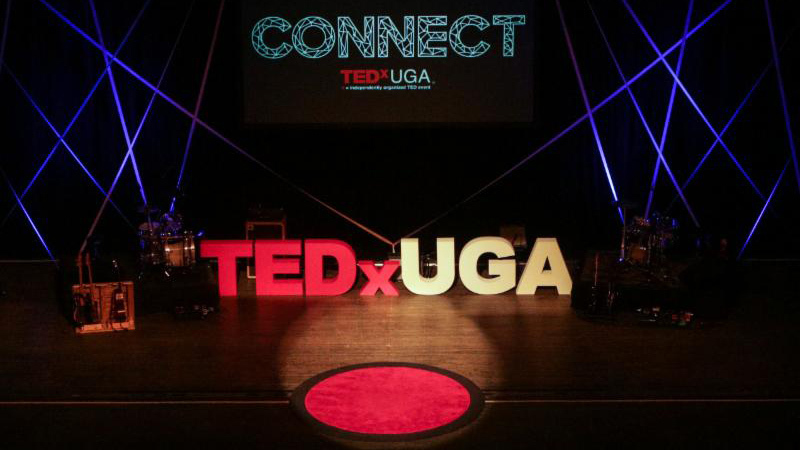 We are already looking for presenters and theme ideas for TEDxUGA 2019. Submit your nomination now!